Whether to maintain a standing army following the Revolutionary War’s end in 1783 was a significant issue for the new nation. Some Americans believed in the necessity of a permanent army to ensure national security, while others considered the force not only expensive, but a threat to the newly formed government. In the “Foundations of the Army” exhibit, located in the Founding the Nation Gallery, visitors will explore the issues surrounding this important debate which culminated during the Constitutional Convention of 1787. Visitors will learn the stipulations written in the U.S. Constitution that Congress has the power to raise and regulate an army, while the President is the Commander-in-Chief of the Army. Through this system of checks and balances, no single person would have sole control of the armed forces of the new nation. The exhibit will explain that the U.S. Army is ruled by the delicate relationship between Congress and the President, and therefore it cannot legally take action of its own accord. The issue of the necessity of a peacetime army was a major point of contention during the early years of the new nation as well. In the exhibit, visitors will learn the different arguments surrounding the debate. Because of the sometimes tenuous relationship between the many states, particularly in the nation’s infancy, representatives from many states believed that individual state militias would be more than sufficient in providing defense against outside threats. While the Constitution does not require the maintenance of an army at all times, the U.S. Army has remained an important part of the nation’s history, its size and influence fluctuating based on times of peace and conflict. The “Foundations of the Army” exhibit will also highlight the Newburgh Conspiracy, an important moment in the United States’ history. In March of 1783, Army officers, disgruntled for not being paid, met at Newburgh, New York, to take action against Congress. Army officers were considering mutiny against the new government, but General George Washington intervened and convinced them to pledge their loyalty to the government. This event came to represent the concept of civilian authority over the armed forces which remains a fundamental idea in the U.S. today. The idea of civilian control over the Army is also discussed in the Army and Society Gallery. 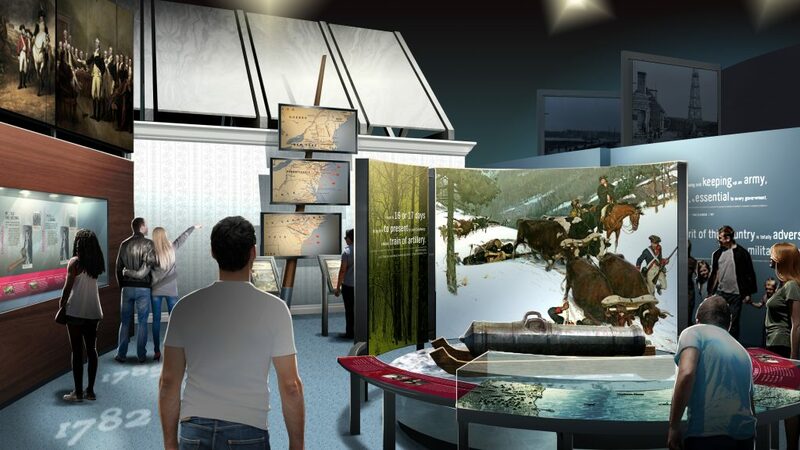 Visitors to the “Foundations of the Army” exhibit will explore the many important issues the new nation grappled with in forming a new government. The compromises made during this crucial period of American history continue to impact the Army today.